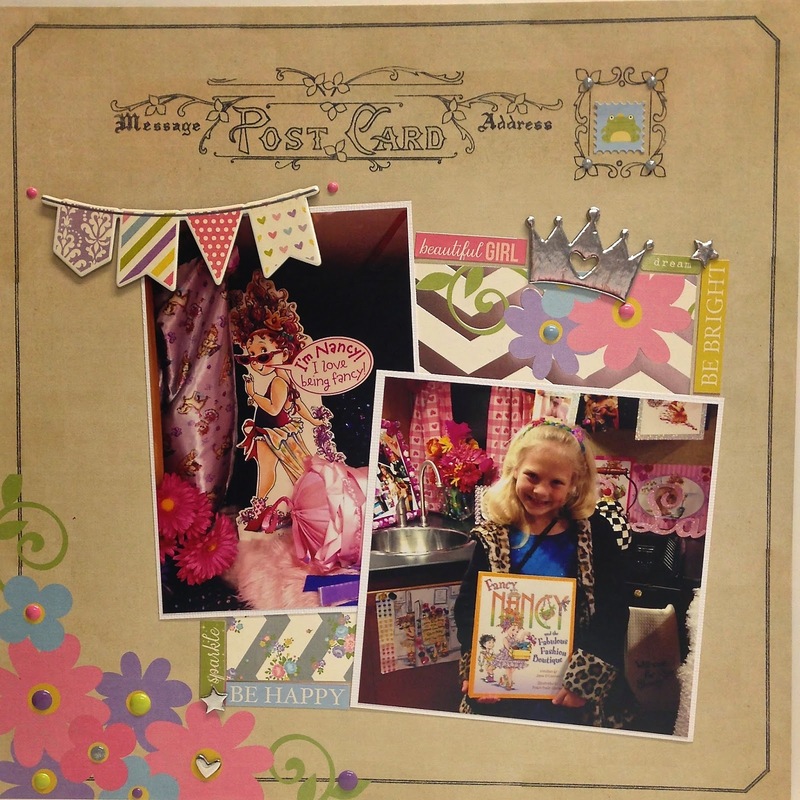 Apryl with FotoBella Design Team sharing another Simple Stories Enchanted layout featuring my princess as she poses in the Fancy Nancy tour bus we had the pleasure of seeing while at the author's book signing. I enjoyed adding all the little details in this layout. See how many fun things you can spy. I layered just a few patterned papers and then went to town with the cute embellishments. I love the chipboard cloud sticker and especially the silver foil chipboard "princess" sticker. 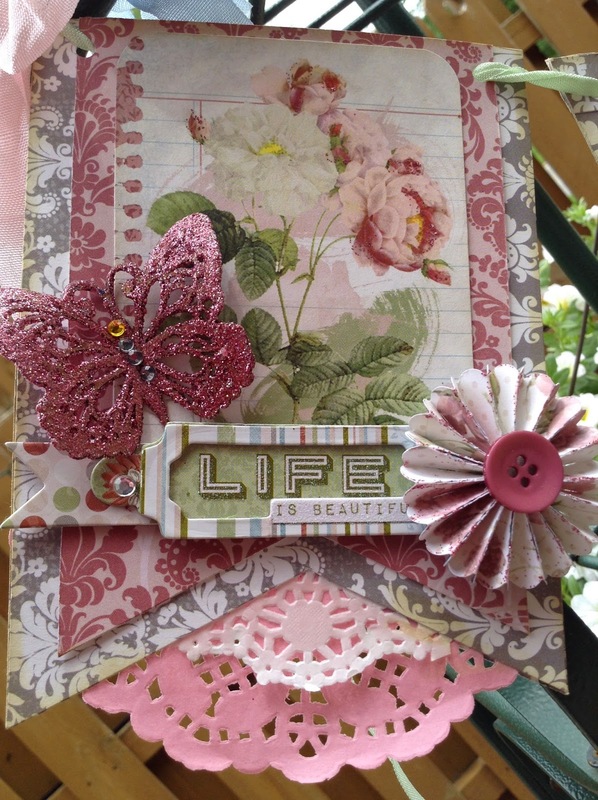 I added butterflies, a crown, the journaling box and paper washi tape. 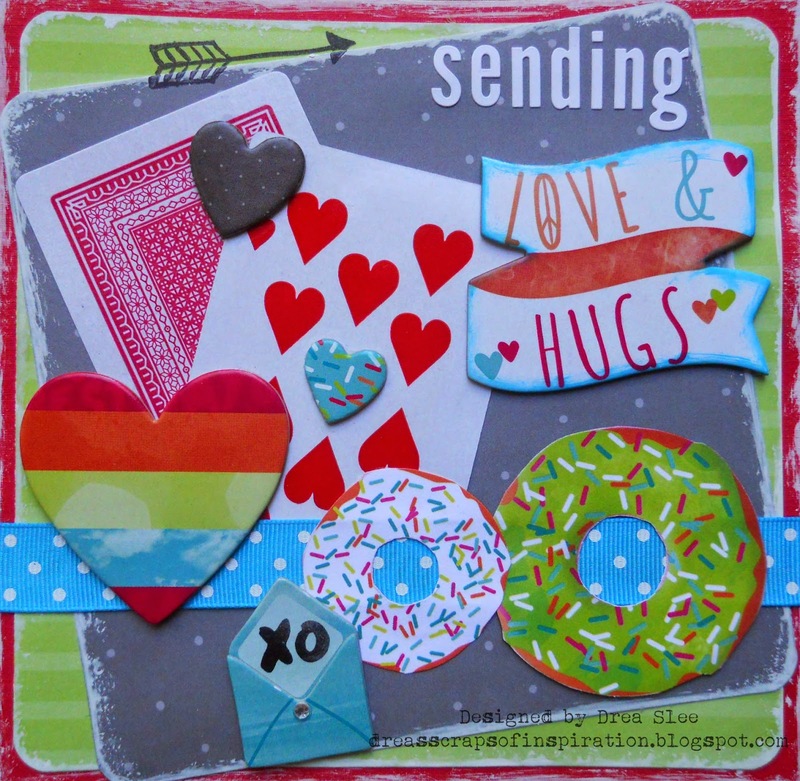 It's a lot of fun to play with embellishments and there's plenty to choose from in this collection. Grab the Enchanted collection and have some fun of your own! 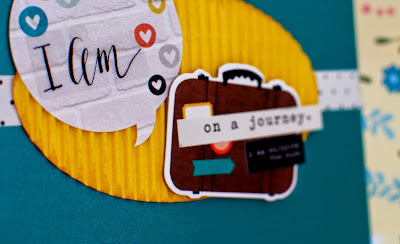 I wanted to share this fun I AM On A Journey Giftcard Holder with you today. I used the I AM Collection by Simple Stories. This is the back of the card, and you can slip a giftcard right behind the Brick paper piece. 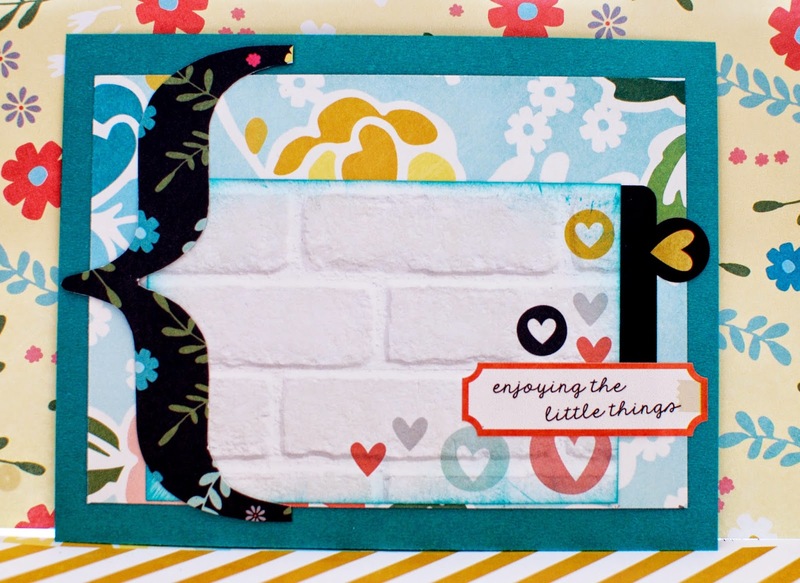 This is ReNae from FotoBella's Design Team, and one of our favorites is the beautiful FLORET. Now, there are lots of dies in the market to make florets...they are available from various manufacturers, and come in several sizes. 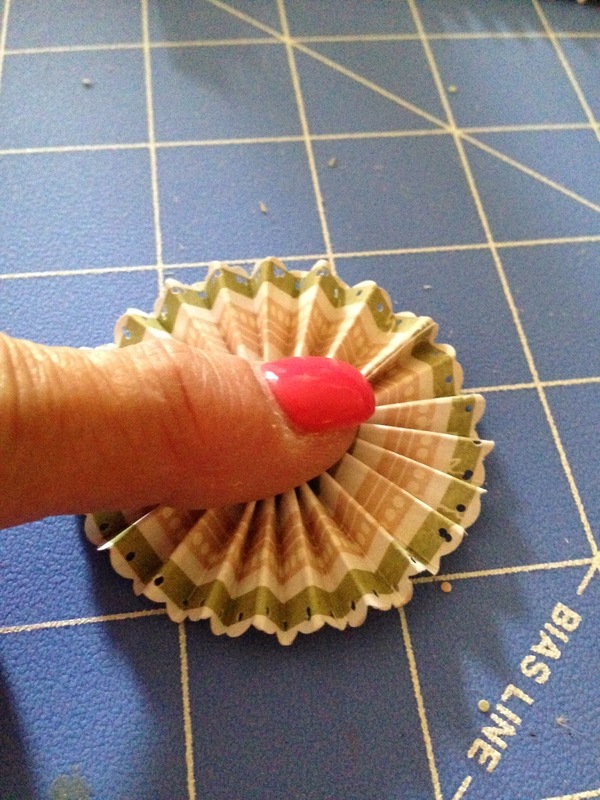 But did you know that you can easily make your own florets WITHOUT a die? And, you can make them in any size you wish! In this short tutorial, I will show you how quick and easy it is to create your own florets by using your own scoring board and a bone folder! 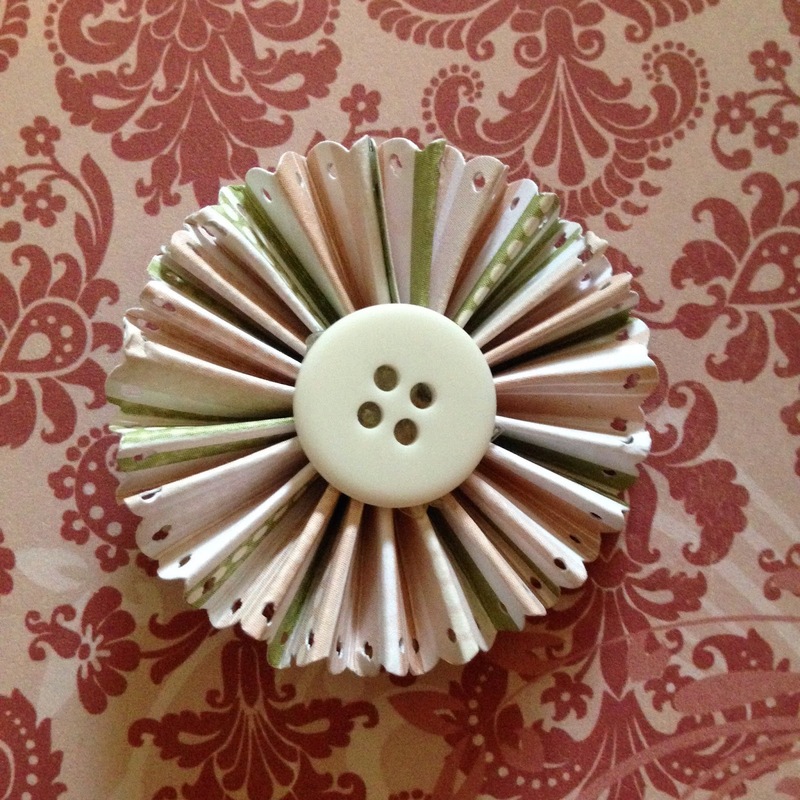 The paper you use for your floret will greatly impact the appearance of the floret. If you select a repeated pattern, such as lined paper, it will give your floret more notice. It will appear to POP on the page. I like to use these for focal points. The direction of the stripes plays a part as well. (see photo in step 1) If you select a more muted color, it will blend into the project and act in more of a supporting role to your composition. In our tutorial I will show you both styles for comparison. Cutting the lined paper horizontally at 3/4"
Cutting the lined paper vertically at 3/4"
Because of the size of this floret, it would require 2 strips of paper to complete the circle. Just use Scor-Tape again to adhere the two strips together. Place your strip of paper on to your score board and score every 1/4 inch. Go across the entire strip. Step 3. PUNCH A DESIGN INTO THE FLORET. 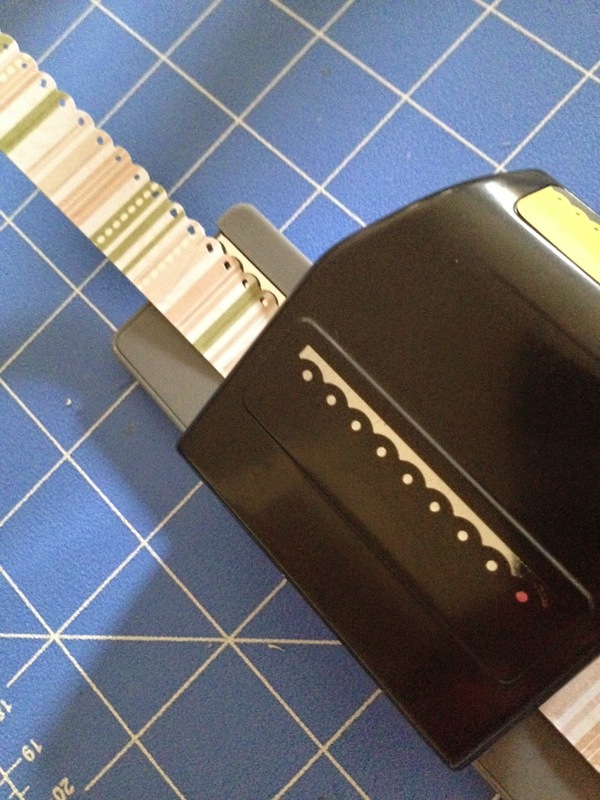 Using any edge punch, cut a repetitive design into one side of the strip of paper, as shown. 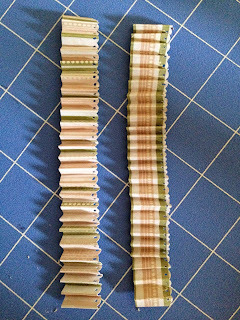 Fold your scored paper strip back and forth the entire length of the paper. Fold forward then backward, forward and backward until the entire strip is folded. Using your bone folder, burnish the fold lines so that they are crisp and sharp. 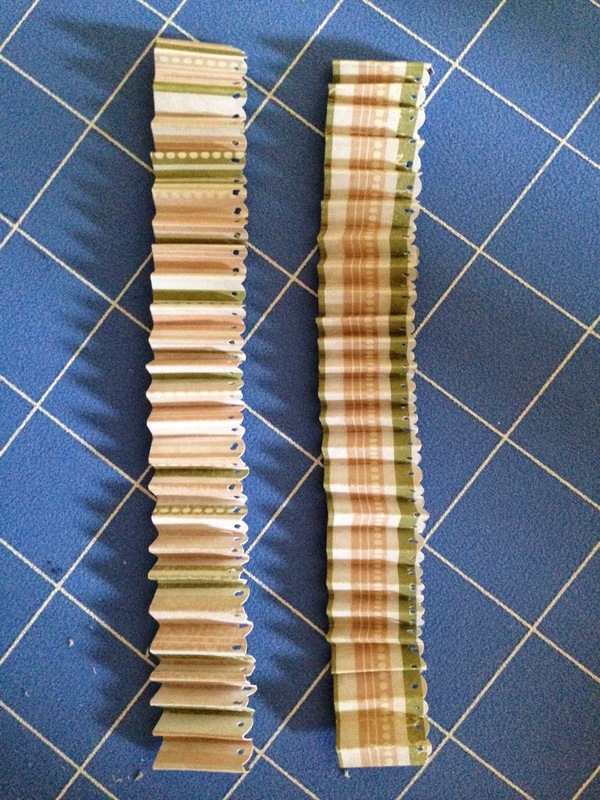 Here you can see the two different paper strips, one cut vertically and one horizontally. 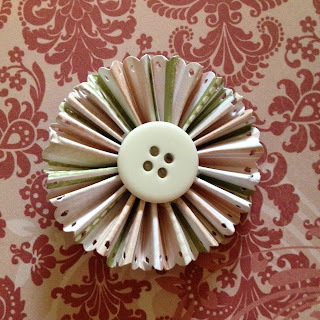 It will greatly change the look of the finished floret even though they are made the same way. Using Scor-Tape, adhere the two edges of the folded paper strip together. 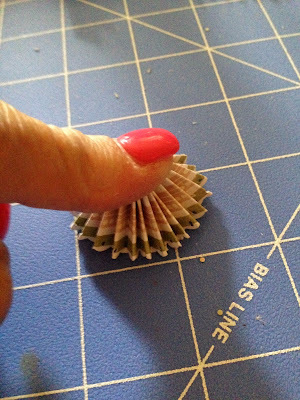 Place a strip of score-tape to one end of the folded floret, and adhere it to the other end. Burnish, making sure the continuity of the folds are uninterrupted. It should be one continuous circle. 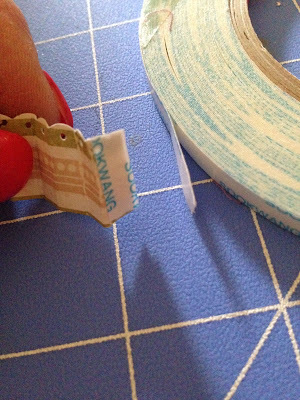 Run the Scor-Tape along the edge and peel off backing. Adhere to other end. 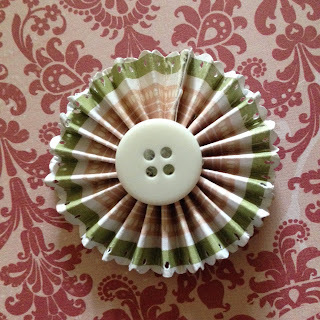 If you are making a large floret, now is when you adhere the two strips together, creating a circle like the one below. This is the trickiest part. 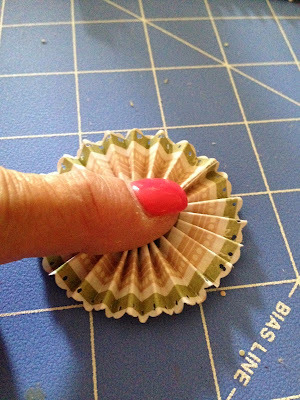 You will want to press down in the center of the floret, and either add hot glue to the center, or place a glue dot to the center of the floret. If you are using hot glue, hold down the floret long enough for the glue to dry ( several seconds) A glue dot is a good alternative, as it is easier to handle and won't burn your fingers! However, it may come off if not adhered down properly. Florets look unfinished unless they have a center dot. This can be a button, a punched out piece of paper, or any other round disc-shaped object. You can use another glue dot or hot glue. Either works great! These little gems are quick and easy and will always match your project! You can make them any size and you don't need a die to make them! 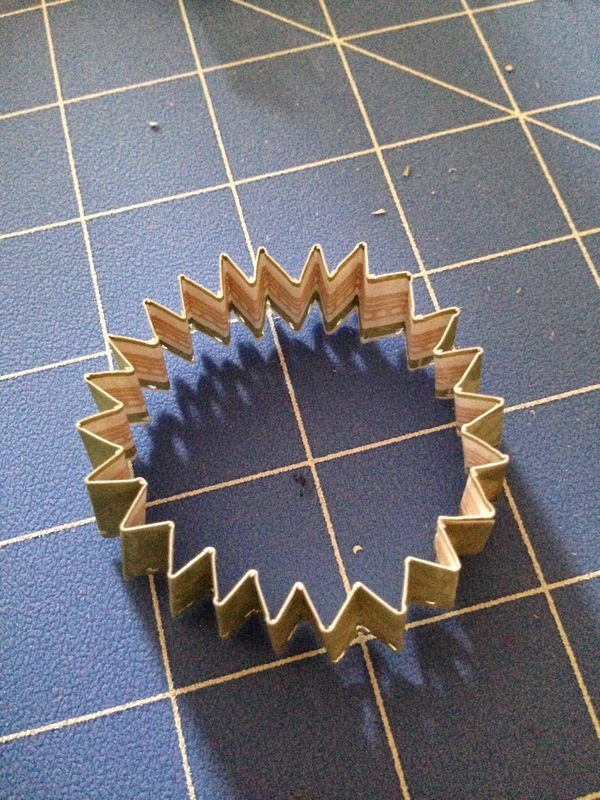 I hope you'll try making florets on your next project! 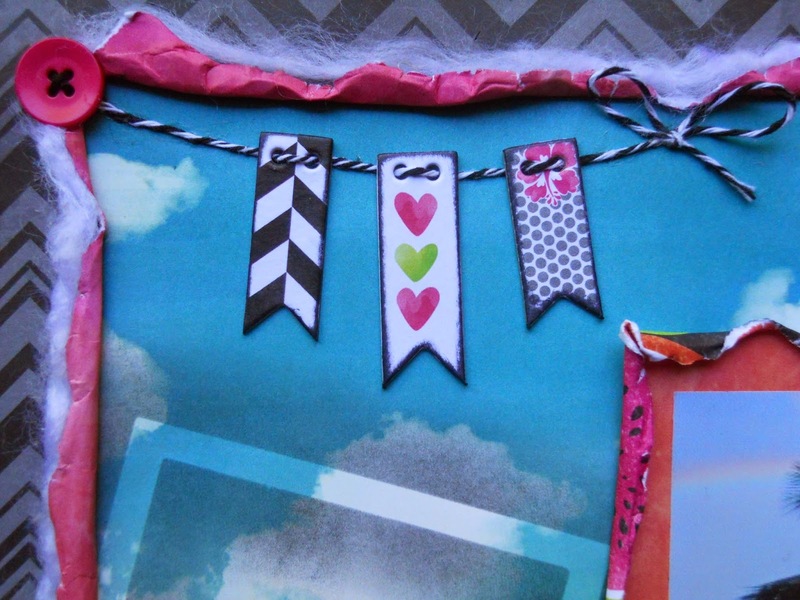 In a subsequent post, you will see that I have placed them on my Bo Bunny Garden Journal Banner. I just loved the way it turned out! Please check back and check it out! Here is another sneak-peek! Hello FotoBella fans! 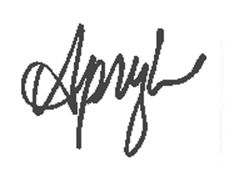 Apryl with you today sharing the new Simple Stories Enchanted Collection I've been working with. This is such a cute collection and FotoBella.com has all the goodies that go with it. Recently my daughter and I had the opportunity to go to a book signing for the author and illustrator for the Fancy Nancy books. The Enchanted Collection couldn't have been more perfect for these photos. This is one of many layouts I will be sharing with you. As part of the book signing, we got to go inside the tour bus. This thing was completely "Fancy" as any Fancy Nancy fan would expect. 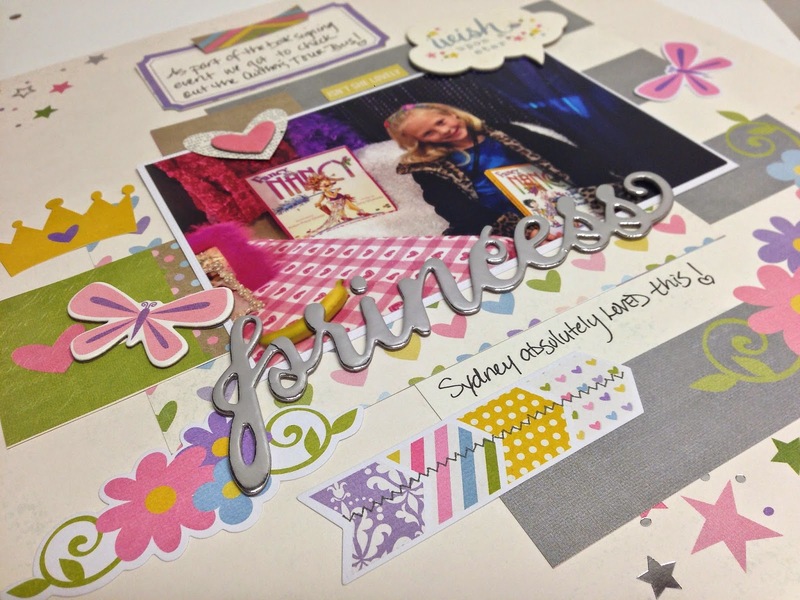 There are fabulous silver foil embellishments in this collection and the chipboard crown is one of them. I also had fun with the enamel dots, using them for all the centers of the flowers. 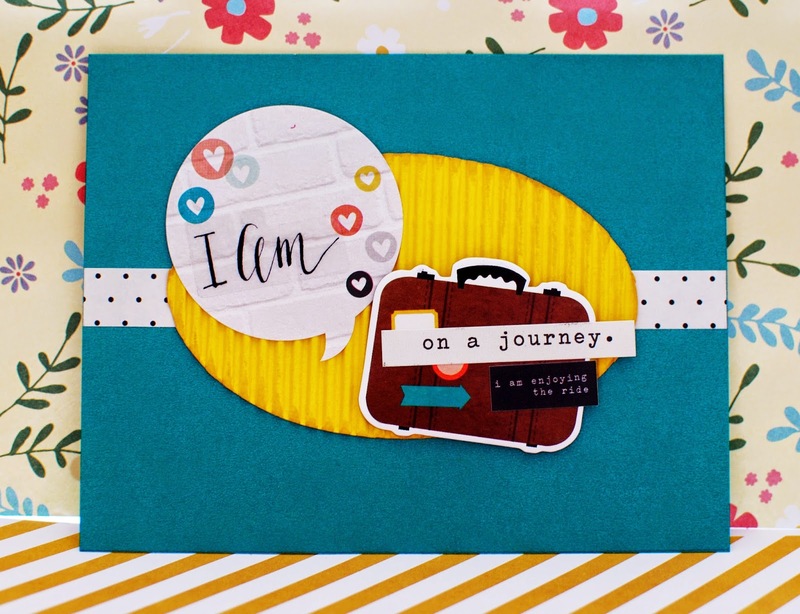 There a lot of fun possibilities with Simple Stories Enchanted Collection. Stay tuned to the blog for more fun projects and visit FotoBella.com to get your own collection. 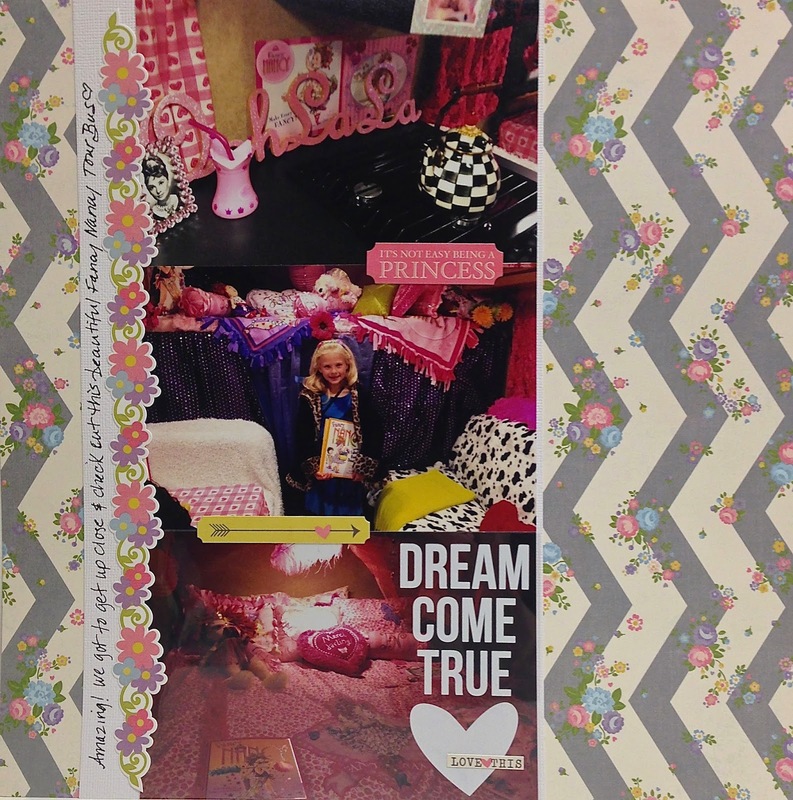 Drea here with a layout to share with you using Bo Bunny's Forever Young I Want It All Bundle from FotoBella! This is a photo that my sister took when she lived in Hawaii, of her view from her lanai. I started by masking the back of the Polaroid that I got from the Noteworthy pack, using Black Soot Distress Ink, which I also used on all of my paper edges. 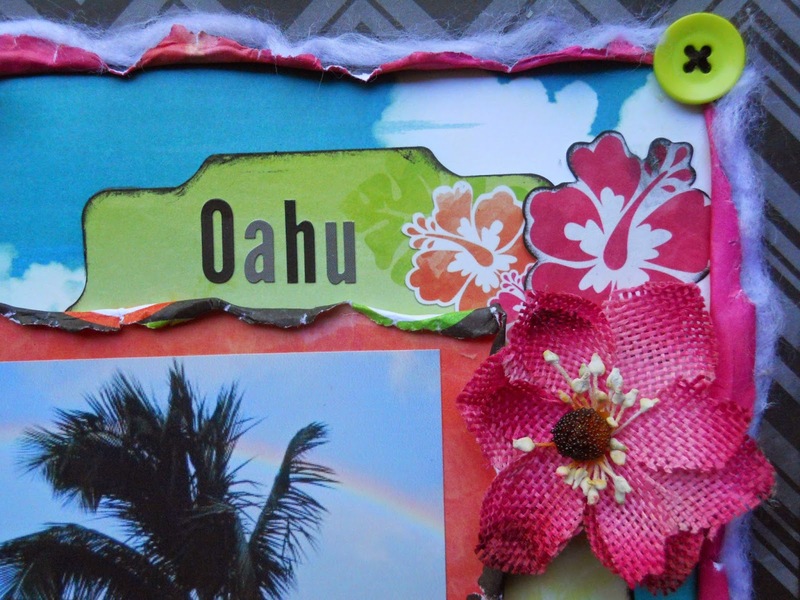 The pineapple, pink hibiscus on the top right, and paper with the title also come in the Noteworthy pack. 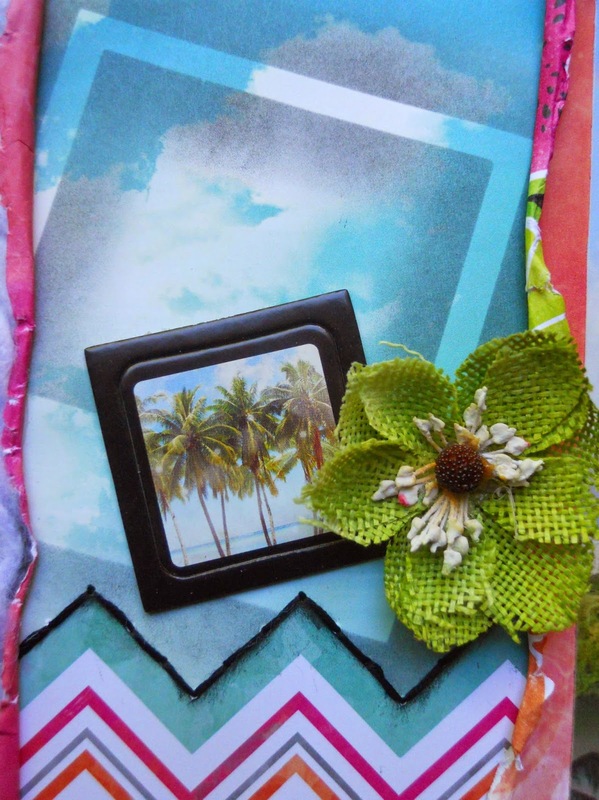 Then I angled the Chipboard palm tree image onto the masked Polaroid. I used some black and white twine from my own stash to make the banner from the Buttons, which I also used in the corners, adding some white yarn in between them to mimic the clouds in the paper. The zigzag paper was fussy cut, inked, and outlined with hand-stitching, which I extended all along the bottom. For the title I used the Alpha Stickers that come in the 12 X 12 Collection Pack, alternating the black and grey letters. Petaloo's new Textured Elements Burlap Flowers match the colors in this bundle perfectly, so I added the Fushia and Pistachio ones, which really add to the tropical feel of this page! Thanks for stopping by, and have a wonderful day! I have a secret addiction to all things 'girly', and I fell deeply in love with this amazing I AM Collection by Simple Stories. I created this for my beautiful niece, who is turning 14 this summer. I am so very blessed to have her in my life, she is my biggest fan. And I am hers. 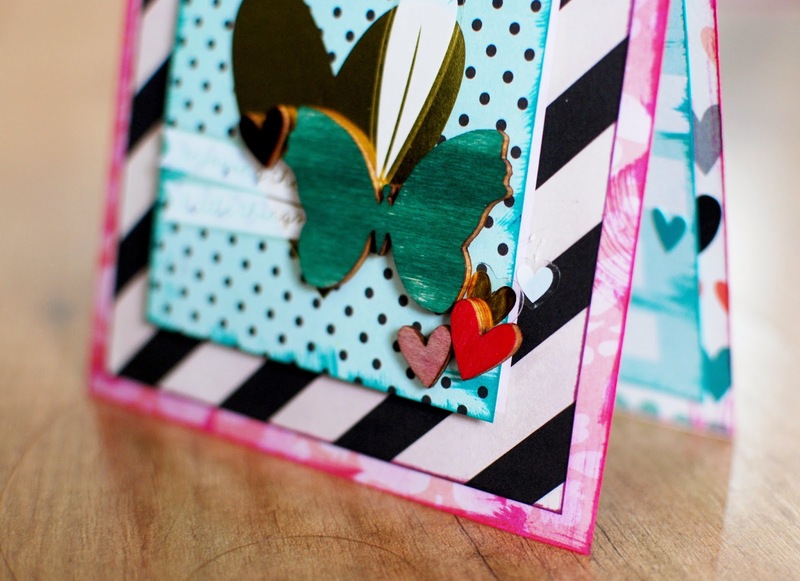 The Wood Veneers were too amazing not to pile on this card. I colored them with some Distress Inks. I also used Distress Inks to give all the paper edges a bit of a messy look. This collection had all the embellishments that explained my thoughts perfectly. I loved this 'Loved By' Photo Sticker. Much more personal then just writing 'from'!! 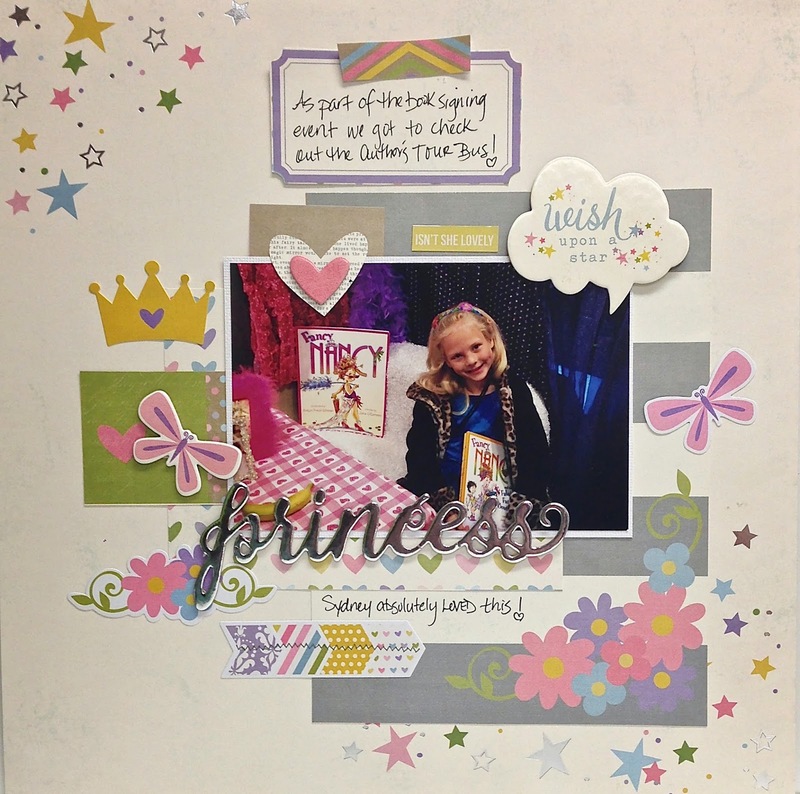 Welcome back FotoBella fans to another feature of Simple Stories Enchanted and Fancy Nancy layouts with Apryl. 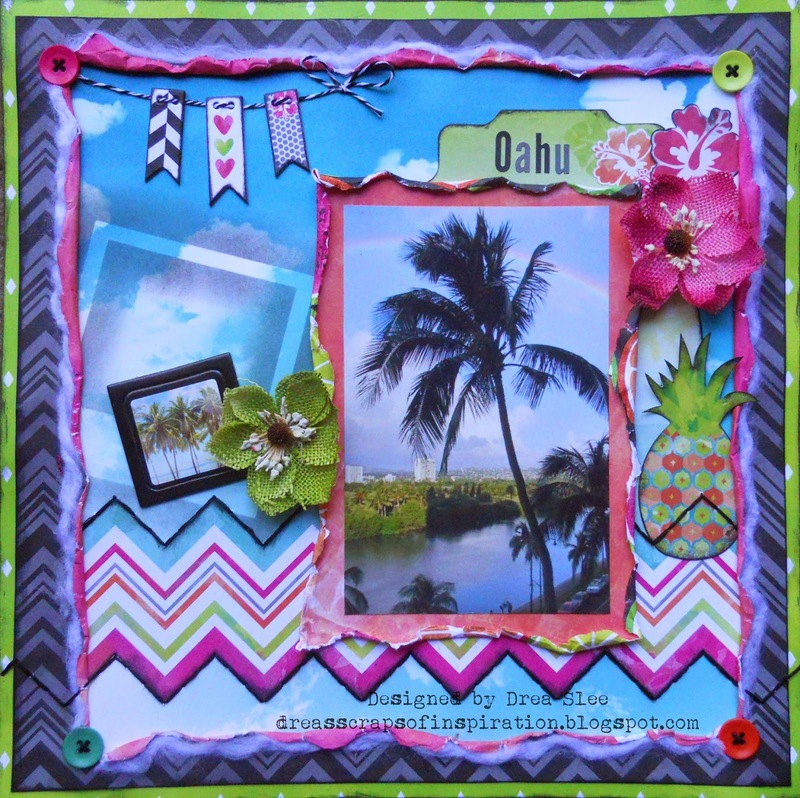 The layout today will accompany the first one I shared with you this month. And, yes, more photos of that outrageously fabulous and fancy tour bus. The background page really pops with chevron and floral pattern. I matted all three photos vertically on white cardstock before placing them on the page. I used the floral border sticker from the 12x12 sticker sheet to go along the left side edge of the photos. 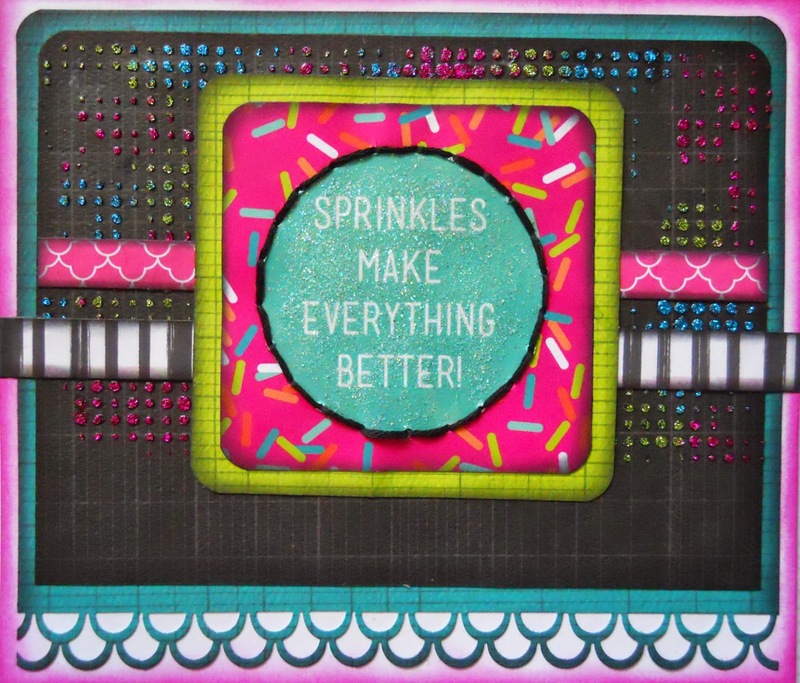 Due to the background paper having a busy pattern, I wanted to keep the embellishments simple. An element I haven't used a lot of in the past is photo overlays. Typically because they usually aren't the right size for the photos I'm using. The "Dream Come True" overlay fit over the photo at the bottom without covering up too much of anything captured in the photo. I added the "love this" phrase sticker for an added touch. I like to get creative with my journaling, and in this layout. I wrote along the left hand side edge of the cardstock matte of the photos. I think it turned out really nice. If you haven't seen the Simple Stories Enchanted Collection in it's entirety, visit FotoBella.com. You'll love everything about this collection! I know I do! Bo Bunny's Forever Young I Want It All Bundle from FotoBella is so fun and whimsical, and full of bold,bright colors! 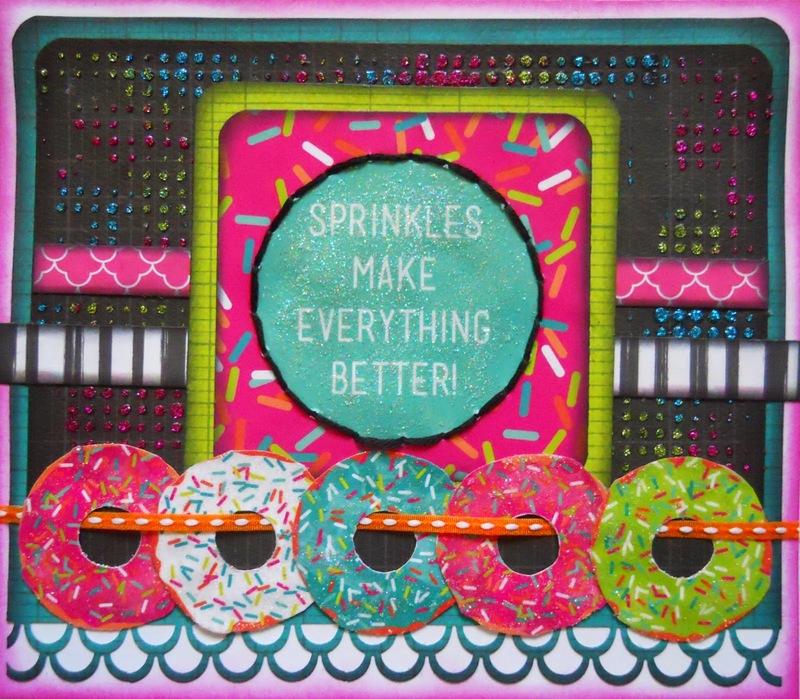 I was immediately drawn to these cute donuts, since they are my favorite sweet, and came up with this sparkly card using Bo Bunny's new Glitter Paste. - White Card cut at 5 3/4" X 6 1/2"
1. 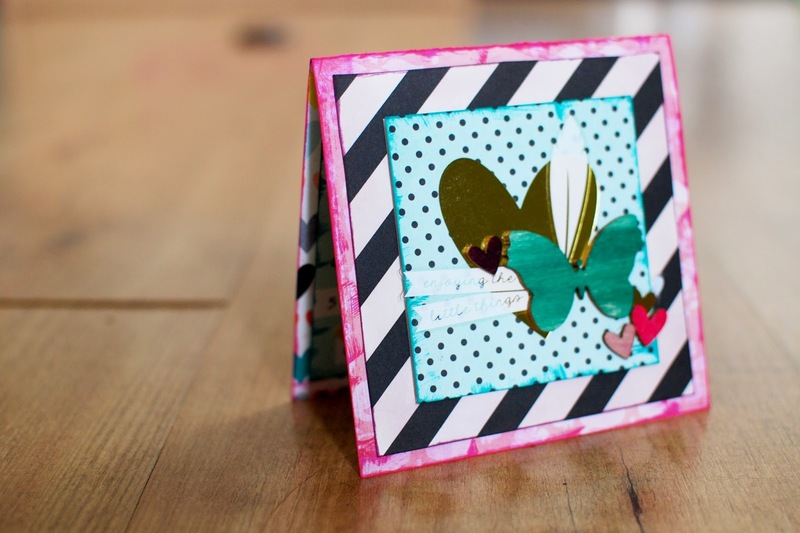 Use blending tool to ink the edges of your white card with Distress Ink (Picked Raspberry). Cut teal, lined paper from the Ephemera at 5 1/2" X 6 1/4". 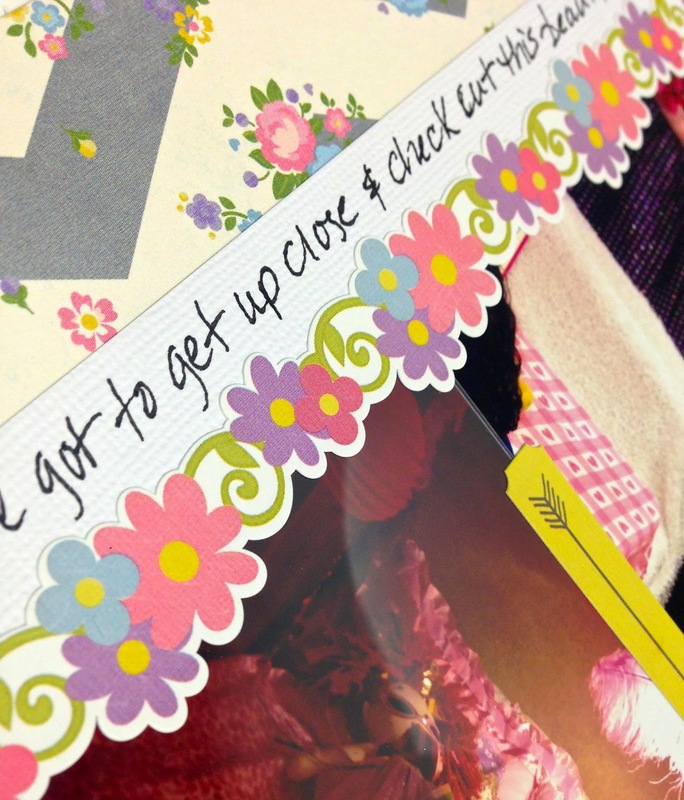 Use a border punch along the bottom, and a punch to round off the top corners. Use blending tool again to ink around all of the edges with Distress Ink (Black Soot). 2. Cut the black, lined paper from the Ephemera in half so it measures 4 1/2" X 6". 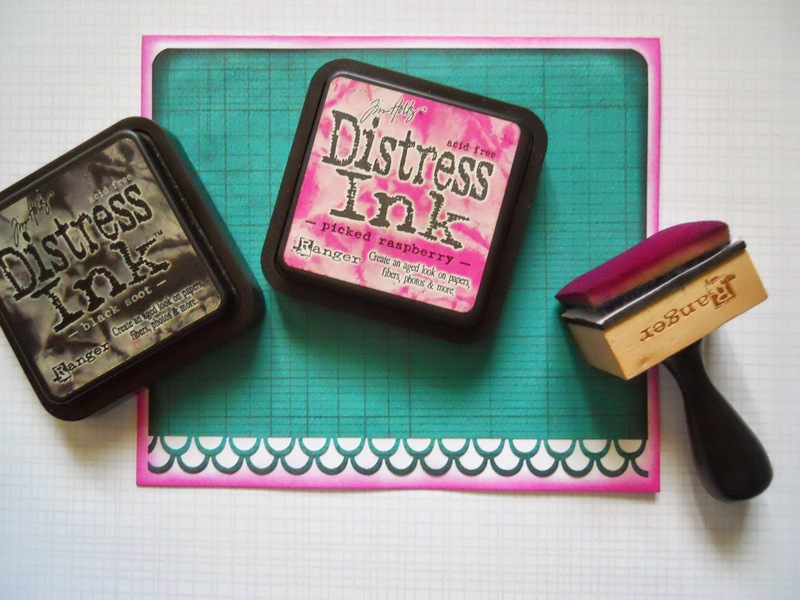 Round the corners and ink the edges with Distress Ink (Black Soot). 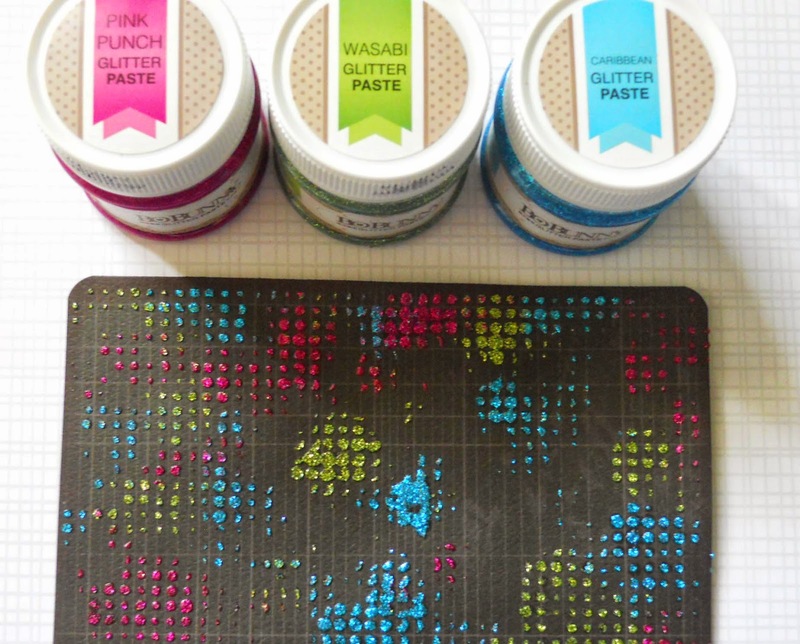 Place stencil horizontal along the top of your paper, and apply the Glitter Paste (Pink Punch, Caribbean, and Wasabi) in random spots with popsicle sticks. 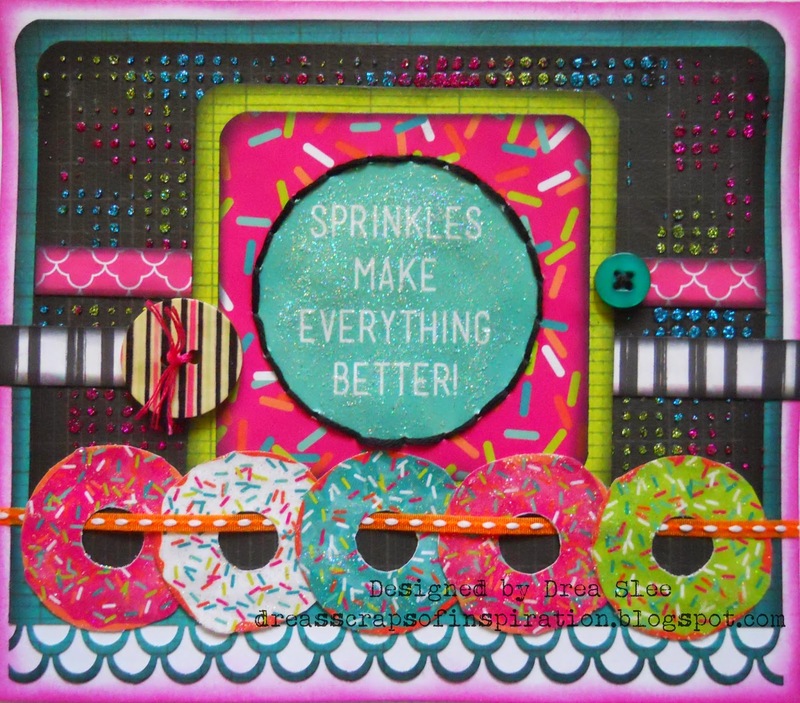 I just LOVE the way the colors pop and sparkle against the black! 3. 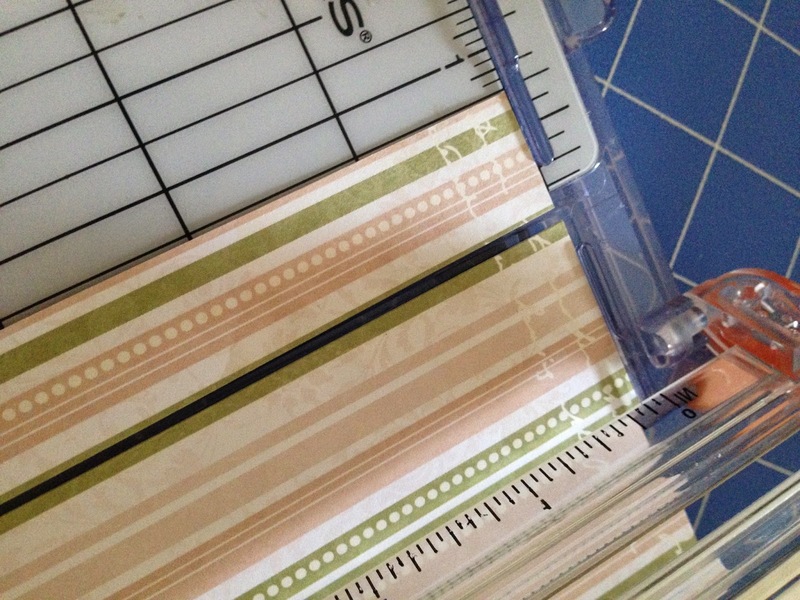 Now cut the black and white strip from the back of the "Heart" paper the length of the card (6 1/2"). 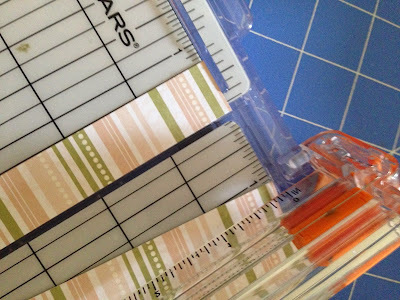 Cut the pink strip from the same paper the length of the black paper (6"). Ink the edges with Distress Ink (Black Soot), and glue the black and white strip 3/4 down onto the black paper. Glue the pink strip 1/4" above it. 4. Cut out the square sentiment from the back of the "Sweet" paper and round off the corners, inking the edges again with Distress Ink (Black Soot). Back it with the green, lined paper from the Ephemera leaving a little less than 1/4" around the edges. Round the corners and ink with Black Soot. 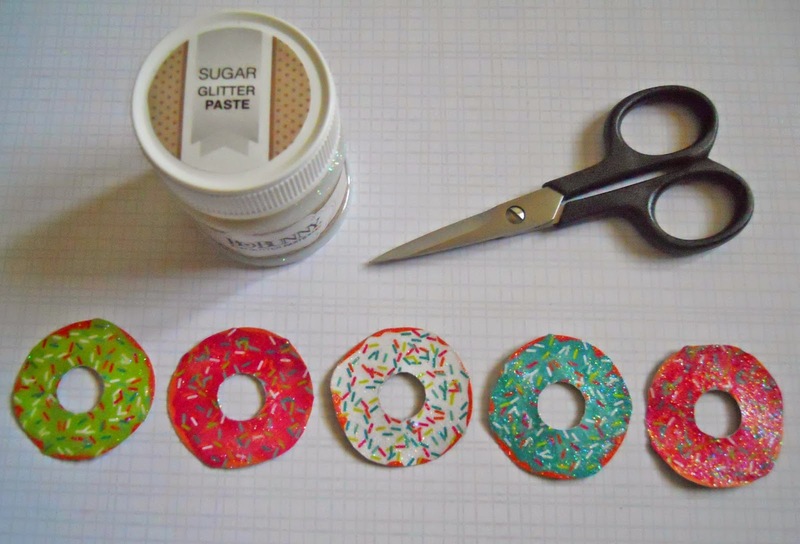 Use the Glitter Paste (Sugar) inside of the circle. Once it dries, sew around the circle with black embroidery thread. Glue towards the center top of the black paper. 5. Fussy cut five of the little donuts from the back of the "Smile" paper. Then apply Glitter Paste (Sugar) to them. 6. Starting from the left glue your donuts on top of eachother overlapping them a little as you go. Cut the orange ribbon from the Ephemera and string it in and out of the donut holes, gluing it in place on the back, so the donuts look like they're hanging from the ribbon. Glue to the bottom of the sentiment and above the punchwork. 7. Finish it off with the the striped and teal button, threading them first with black and pink embroidery thread. Thanks for looking! Hello, Apryl here and since Simple Stories Enchanted collection arrived on my doorstep from FotoBella.com, it has not left the craft table and finding it's way into layout after layout. Ok, this is one of my favorites! 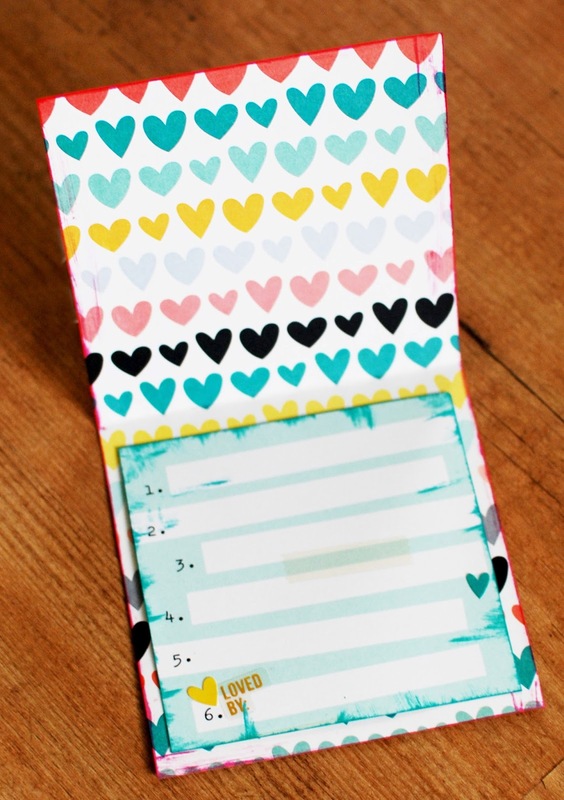 The layout is made primarily with the 4"x4" element/journaling cards. 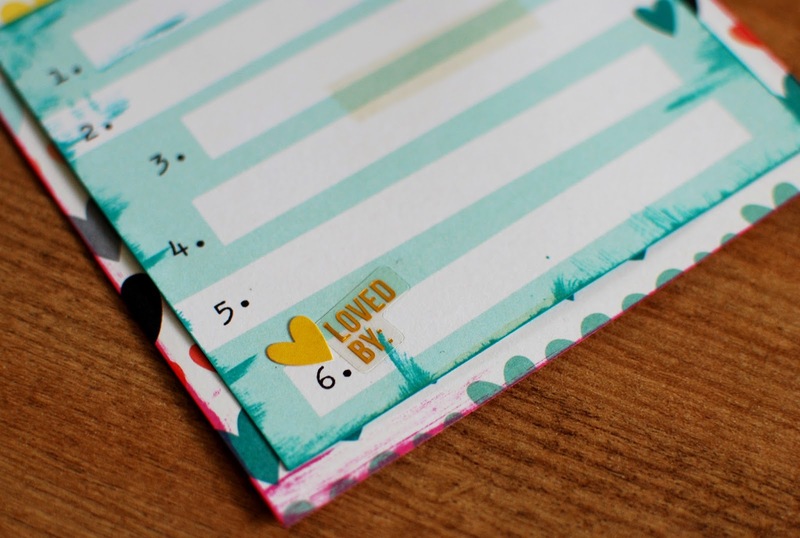 The exception is the small heart patterned paper that runs through the middle of the page. I really like this type of layout because it is like a puzzle. Each little square has it's own thing going on, and put together it tells a story as a full 12"x12" page. 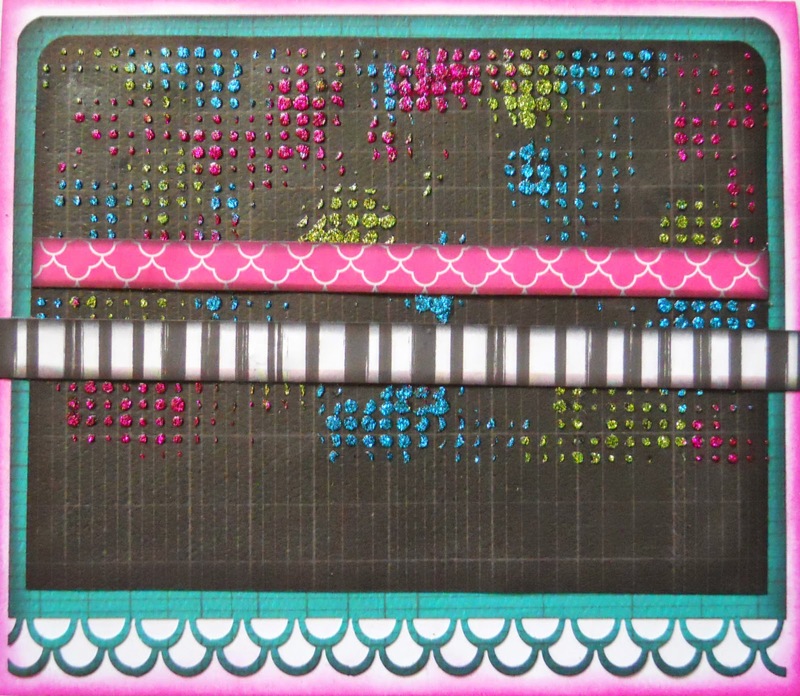 I treated each square individually when it came to embellishing. And here at the top left corner, is the journaling, using the arrow stickers from the sticker sheet. There's quite a bit of eye candy in this layout and honestly, I can't stop staring at it. Hope you find the Enchanted Collection just as enchanting as I have. Visit FotoBella.com to get your own.